Less controversial? You called graffiti good. My English 101 prof claimed to have done his thesis on graffiti as literature. I'm all for somebody improving the aesthetics of an otherwise neglected wall with a mural or some thoughtful prose, but what are the merits of simply tagging it? What's interesting about signing your made-up name to an abandoned building or an overpass? you guys make good points. is graffiti a good thing? i don't know. i do find it interesting. maybe "good" wasn't the right word to use- i think "interesting" is more appropriate. thanks for commenting! i hope to get the dialog going on here about the pros and cons of graffiti in our city. if we're calling graffiti art, we should at least critique its relevance, beauty, and method. as long as we're in the defining mood, what makes something art anyway? what is art? is life art? is art art? (that's lisa turtle from saved by the bell, y'all). but can that be possible? can you have one without the other? or does graffiti cease to be graffiti if it's not also executed in the traditional manner? Those are great, stan. If it makes you think or makes you laugh, then I say have at it. I just wonder why people like Ghost would take the risk of breaking the law, not to mention wasting perfectly good paint, just to tag. Is it like some kind of grown-up Pokemon or something? Is this Ghost's turf now, trespassers beware? "There are no little things": I think it was "The Tipping Point" that opined that communities being lax on things like graffiti and turnstile hopping resulted in a higher rate of more serious crimes as well. i never read "the tipping point." "blink" was excellent though, so gladwell's other work is on my list. in response to mickey's comment earlier, i don't know about tagging=art. but i do know that leaving our mark is a pretty big deal to any of us. 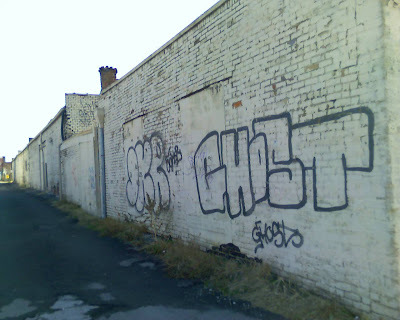 Assuming that all graffiti is vandalism and therefore criminal, how much more criminal is owning buildings that one allows to rot creating an area of blight? Is it a greater or lesser crime to tag a building in a condition of great disrepair? I don't know that I'm adding or detracting from the conversation, but I think the two subjects are closely related when discussing things that are good and bad for the city and for the public. Simple tagging usually does nothing for me. However, having seen some graffiti that obviously took time, effort and talent, I can appreciate it. What if we were able to allow some of our town's more talented graffiti artists to decorate certain places such as the I-40 bridges that form a sort of arch of a gate way into the Old City over Central? Samuel, it is because they wish to not support any graffiti artist.